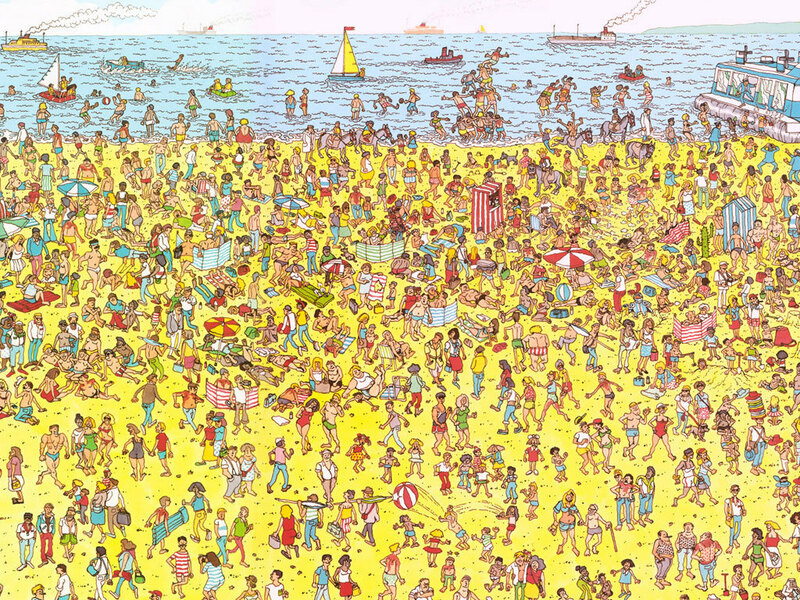 Have you ever played the eye teasing game of Where's Waldo? If not, the game is about this guy, Waldo. He seems to be able to loose himself in crowds at circuses, art museums, beaches, and cities all over the world. He's really quite the well traveled guy! The pictures look like the one below. 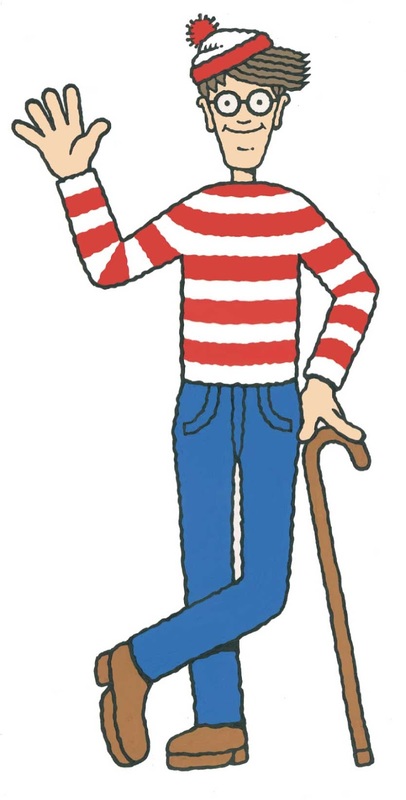 You can literally search for hours and NOT FIND WALDO!!! So frustrating to say the least. For those of you who have been looking for the completion of the Easy V Super Express Top from Islander Patterns, I should have the next video up later today. This is the most important video as I will show you how easy the "burrito technique" is for finishing the neckline. 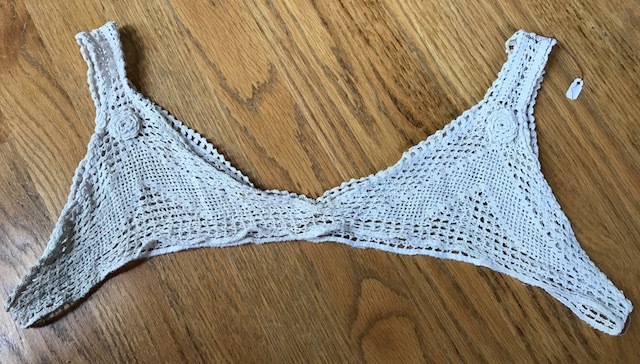 Once I've shown you how to finish the neckline, I'll then share some fun possibilities with you. Lots of fun things are coming up. On Monday, I will be hosting a fabulous giveaway that you won't want to miss out on. So be sure to pop back by. In September, I will be teaching at The Original Sewing and Quilt Expo in Schaumbug, IL. The date of the expo is September 28, 29, and 30 2017. The classes for Schaumburg have not been posted, but I'm sure they will be up soon. I'll share more about what I'll be doing in upcoming posts. She just came back from a fabulous trip to Japan and South Korea. 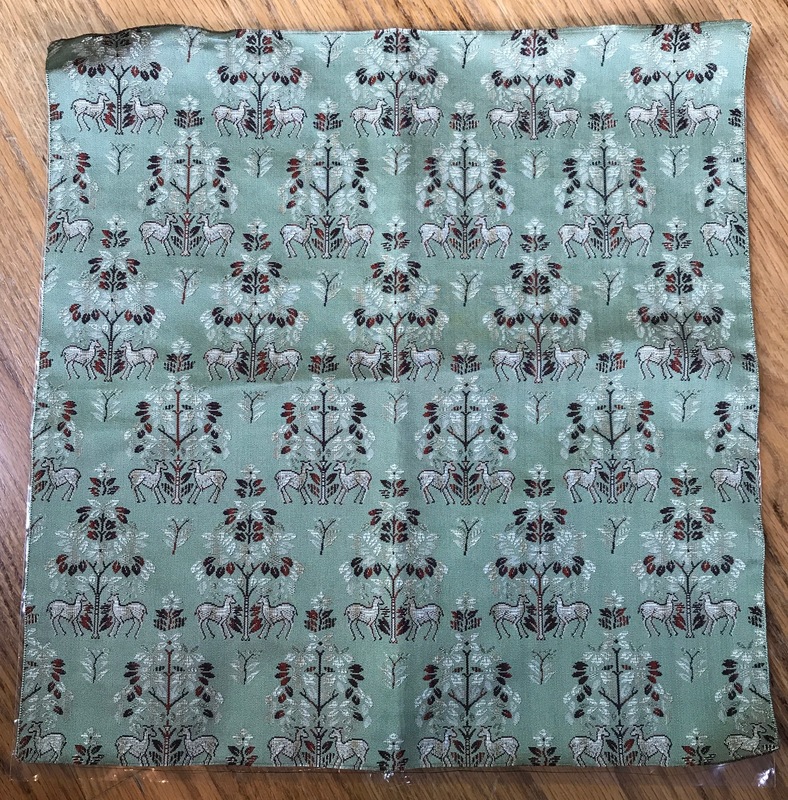 I was shocked when she pulled out a gift that she had picked up for me, a gorgeous square of fabric. She found it at a store in Kyoto called Kamiji Kakimoto. The store is known for its selection of washi paper. She said that they had a small display of fabrics that were locally made and she just couldn't resist a treat for me. The fabric is silk and so gorgeous. The picture really doesn't do it justice. I have decided to keep the piece intact and make a little clutch bag with a zipper, just something simple, but meaningful. Over this past weekend, I was in St. Louis, Missouri for the annual opera festival. What a wonderful time I had, but then, I always do :) The most dramatic operas were The Grapes of Wrath and Madame Butterfly. Both were amazing productions. I stopped by a Joann's fabric store to pick up some knitting needles and my eyes fell upon this magazine, Sew Style Simplicity. Sew Style is a U.K. published magazine. You may remember the Sew Now magazine that I featured a few weeks back. This magazine is similar, but rather than 2 patterns, it comes with 3. Inside the magazine, you'll find links to ton of free patterns. 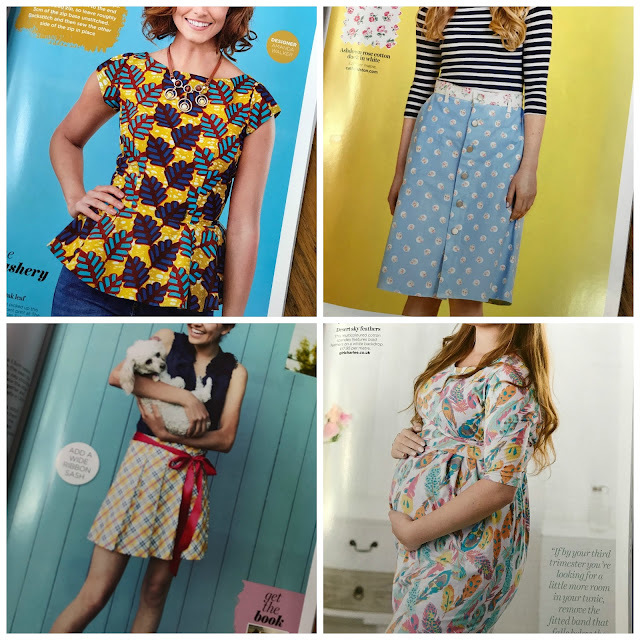 I've featured a few below, the little peplum top, the front buttoned skirt, the super cute pleated skirt, and even something for the mommy to be! There are also a number of accessory patterns as well, like the satchel bag and the laptop bag. 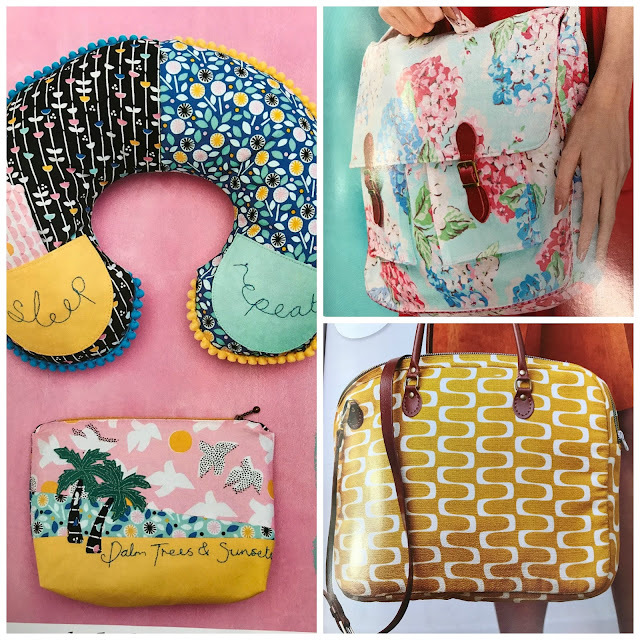 The neck pillow and zip pouch would make an easy to make, great gift for anyone going on a vacation. So, if you are in the United States, look for the magazine at your local fabric store. 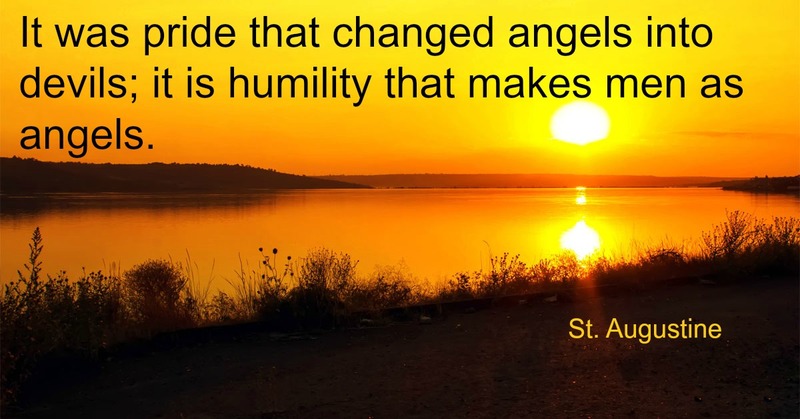 You can also find it HERE online. My small investment was well worth the entertainment that I received from the magazine. I think I only paid $15.00 for the pair. The manager of the gift shop said that they had been their for quite some time and no one knew what they were or what could be done with them. Well, lucky me! They will now find a nice home on a top or dress, and probably a pair of pajamas. 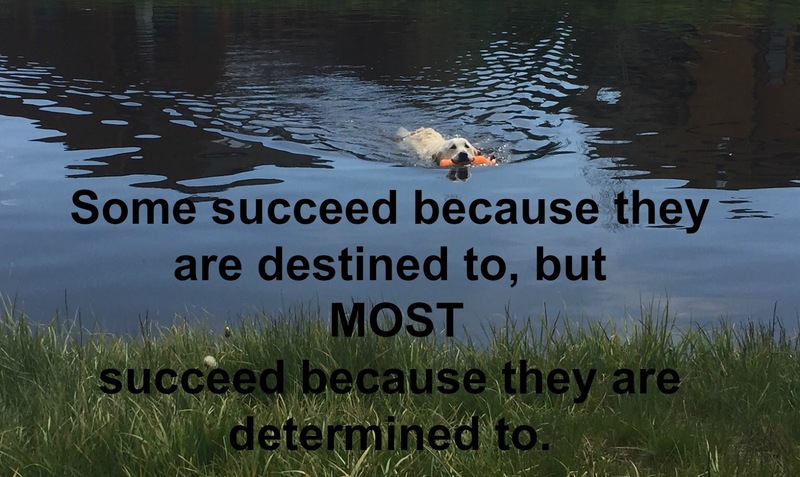 Hope you are having a fabulous summer, or winter as the case may be. My week is off to a great start, I'm being a bit facetious ;). We arrived home last night to find our hot water heating spewing water. Exciting! So I am now waiting for the guys to arrive and install a new one. I find it rather interesting whenever something happens and I'm without one of the modern conveniences that I've become so accustomed to, be it electricity, hot water, or even something like the dishwasher, and how life just suddenly seems to get rather complicated. Some talk about returning to the "good old days," well, I like these brand new days just fine and I'll be VERY happy when I can take a nice hot shower. I think everyone around will be too!!! I opened my Facebook page this morning and found that the video below was posted 4 years ago. For any of you who are new to the blog, this was a project that so many participated in. I found out about a project at the Mary Bridge Children's Hospital in Tacoma, WA. Each child who is admitted is given a special handmade pillowcase. Such a lovely way to help calm a child. My goal was to collect 1000 pillowcases, and we made that goal! It was so exciting to see the pillowcases come in from all over the world. During the project, I heard from a few parents who had lost their children, and they told how much the pillowcase that was given to their child continues to mean to them. You would think that something that was attached to the death of their child would not bring comfort. But as I thought about it, I realized that there is something almost magical about the pillowcases, and it's because they were made with love, and I think that this is what the parent continues to feel. Not only did they love their child, but a stranger cared enough to make something that exhibited their love for a child they would never meet. Once I learned more about this project, I found out that hospitals all over the U.S. have similar programs. You can read more about the program HERE. And if you would like to make a pillowcase, click HERE. The video above was done early in the project. You can scroll though and see more pictures HERE. 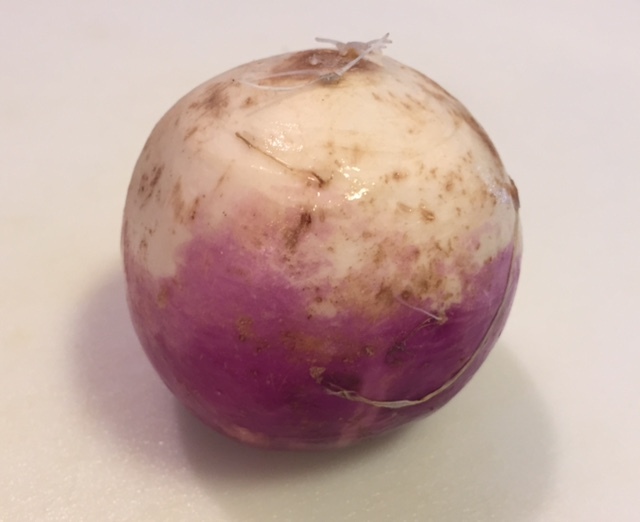 My grandmother loved turnips. I did not, but I did love creamed potatoes. One day, she called us in for lunch. I sat down at the table and saw a beautiful bowl of what I thought to be creamed potatoes and proceeded to help myself to a nice big helping. Once everyone was served, I grabbed my fork, shoveled on a great big bite of what I thought was potatoes, and to my shock and dismay, it was creamed turnips. Uck!!! Well, taste buds mature, and I can't say that I love creamed turnips. but I do like the flavor they add when combined with other vegetables. Another dish that my grandmother liked to make was a combination of turnips and green beans. I was recently thinking about her, and oddly enough I remembered the green bean and turnip combination. As I thought, I began to think that this might make a great bowl of soup. Guess what!, it does!!! With the addition of the sharp taste of the turnip, I decided to call the soup, Twisted Green Bean Soup. I began with a chopped white onion, and 4 stalks of chopped celery which I sauteed in a tablespoon of olive oil until tender. I then added 2 finely diced cloves of garlic, the green beans, and 1 diced turnip. To thicken the soup and add a little extra protein, I added a 14.5 oz can of drained and rinsed navy beans. I love the combined flavor of turnips and carrots, so I added 1 large sliced carrot. And if you look closely, you'll see that I also added a cup of chopped parsley. For added flavor I added 2 bay leaves. And finally, 8 cups of vegetable broth. The mixture was then brought to a boil. The heat was then reduced to a simmer and allowed to cook for about 30 minutes. Once the vegetables were tender, I pureed all but 1/4 of the soup. One more 14.5 oz can of drained and rinsed navy beans were added to to the soup mixture. The soup was allowed to simmer for another 30 minutes and then enjoyed! Heat oil in large pot. Add onion and celery and sauté until tender. Add garlic, green beans, turnip, 1 can of navy beans, parsley, carrot, bay leaves and vegetable broth. Bring to a boil and then reduce heat to simmer. Simmer for 30 minutes. Remove bay leaves and puree all but ¼ of the soup in a blender. Return to pot and add the second can of navy beans. Reheat the soup and allow to simmer for another 30 minutes to completely combine flavors. Serve and enjoy! The soup will freeze well for lunches. If you give it a try, I hope you enjoy it as much as we did. I just love getting new things to wear, but then, don't we all?!!! So I am so very excited about doing this sew along with the Islander Patterns Easy V Express Top. I get new things to wear, and you get to see a few things explained. The video isn't my best. 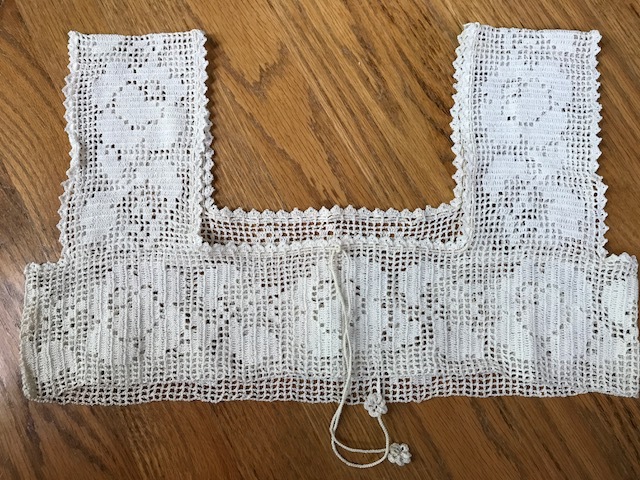 I didn't sleep all that well last night, and I am just a little off my game, but I think it will shed a little light on the neckline pleat and give you some good pointers as you begin. For this top, I only used a yard of fabric. I measured it out just to make sure and it was exactly 37". I cut an XS size and the pattern calls for 1 1/2 yards. So if you have a yard of fabric that will fit the bill, by all means, give it a try. 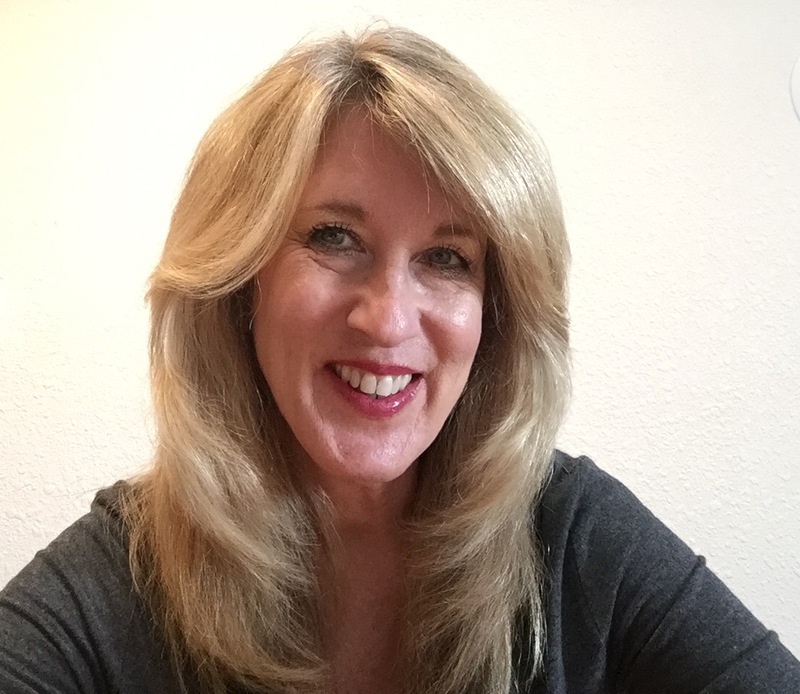 In this video, I talk about fabric choice, the pattern, and constructing the pleat at the neckline. In our next video, we'll talk a little more about construction, especially the great neckline finish. 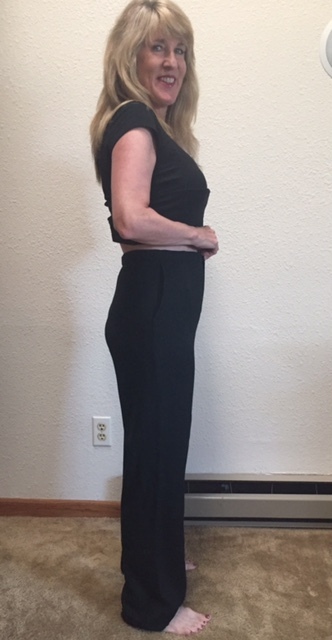 We'll also talk about fitting, and what I did to get a nice fit on my dress. Have fun, and if you have any questions, be sure to ask. I'll do my best to answer. Remember, Janet is offering the pattern to anyone who comes by the blog at a 20% discount. Just use RHONDA in the promo code box. You can find the paper pattern HERE, and the downloadable pattern HERE. 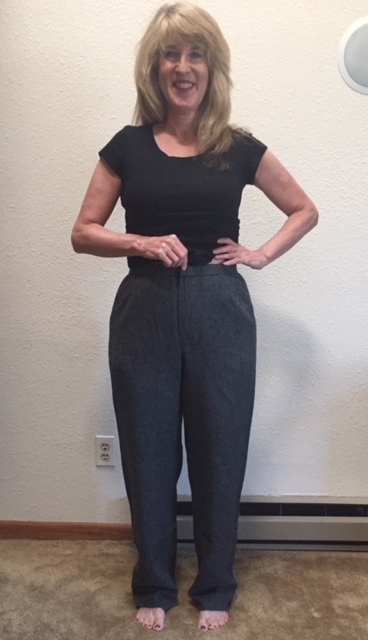 Before I begin the Islander Patterns Easy V Express Top sew along, I wanted to do the follow up post to the pant fitting retreat. 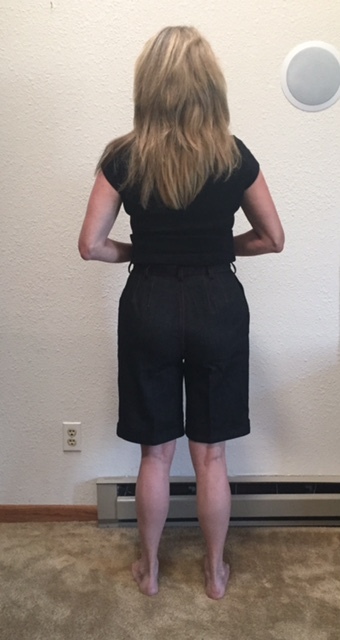 As I told you in the previous post, I made 2 pair of pants and a pair of shorts. Although the same pattern was used for each pair, there were slight changes made. I used a wool crepe for my first pair. If you have worked with wool crepe, you know that it has a looser weave than other wools, so it can grow a bit. The side seams were taken in to get a closer fit, but all in all I was happy with the outcome. 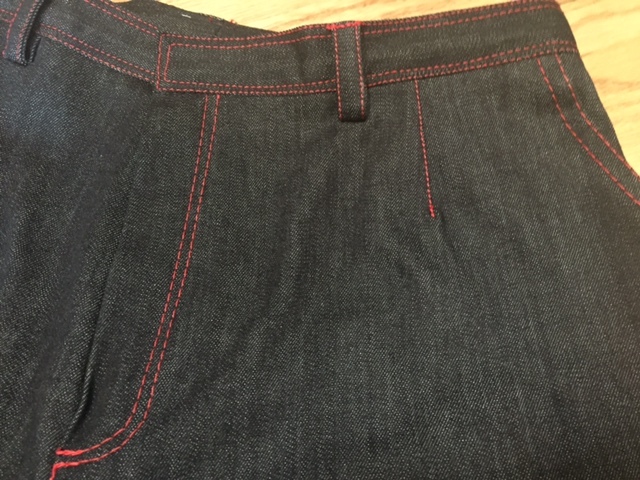 Just a note, I have not hemmed my pants, and I also need to add the hook closure to the waistband. Since I used a black fabric, it's a little difficult to see how the back fits, but they feel great and I am happy with how they hang. I LOVE having a beautiful lining in all of my clothes. Kinda like my own little secret, that just might get a slight reveal at times ;) This fabric makes the pants feel like a dream when I slide them on. For the second pair I made, I used a herringbone from Pendleton Wool. A gorgeous piece of fabric. There's just a slight caving in at the back of my leg in this picture, I'm not sure if it's the pant, or how I'm standing. I have a feeling that it's how I'm standing. This pair also appears to be just a little snug in the back crotch seam. 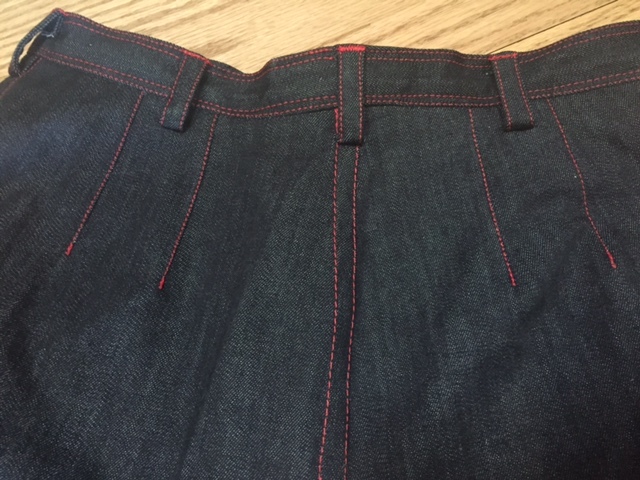 I have not clipped the seam, so once that is done, I think it will make a big difference. Once I made this pair, we then made some alterations to the pattern which I did not want to do after the wool crepe pair due to the fabric characteristics. 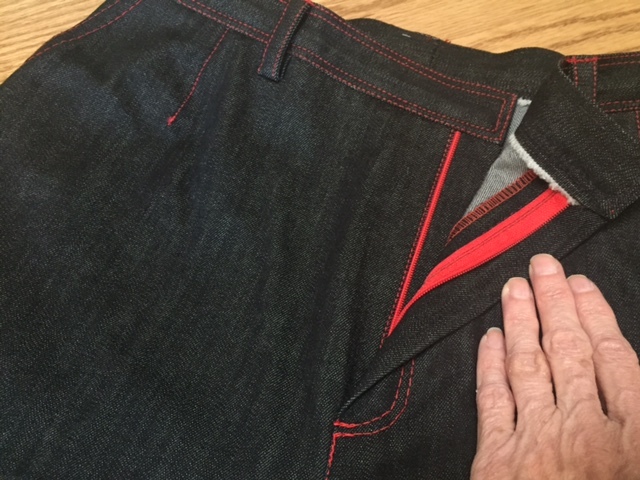 I used a basic bemberg lining in this pair of pants. Boring!!! 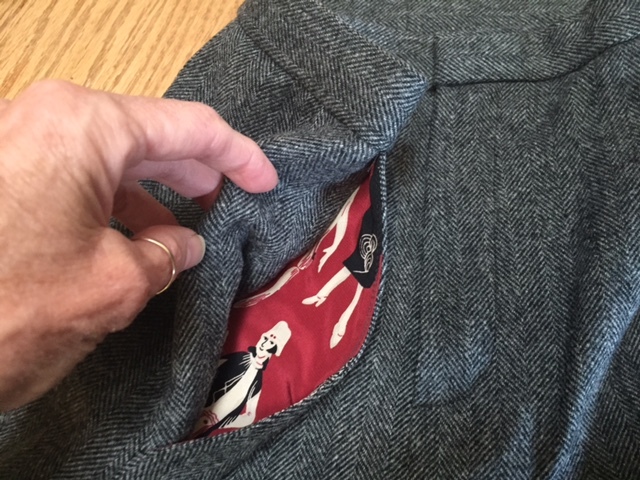 I had intended to use a fun piece of silk, but I was just a little short, so I used it as my pocket lining, just to add a fun touch. 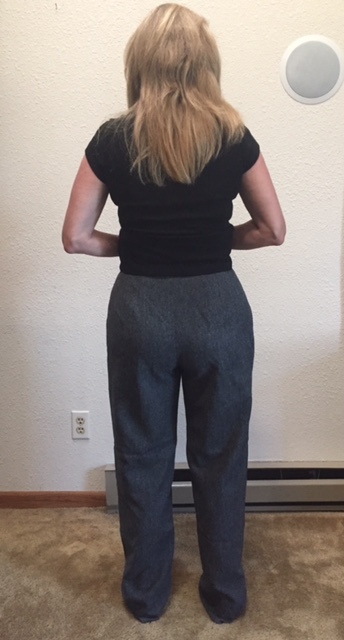 In the wool crepe pants, I used the wool crepe as my pocket lining. 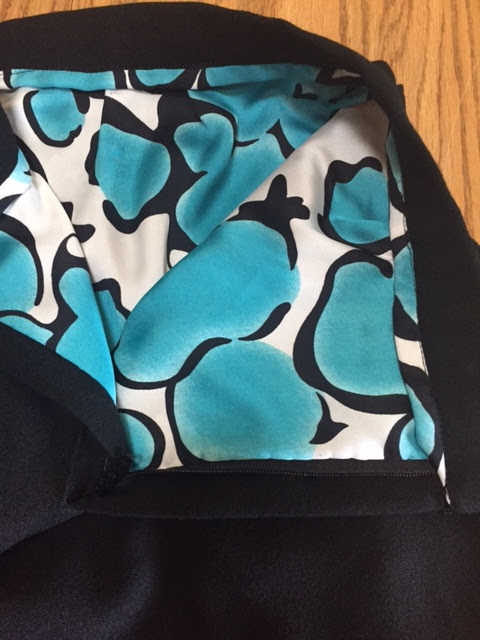 I really prefer using a lining fabric for the pocket lining as I feel that it makes pants and skirts alike fall a little nicer over the body. 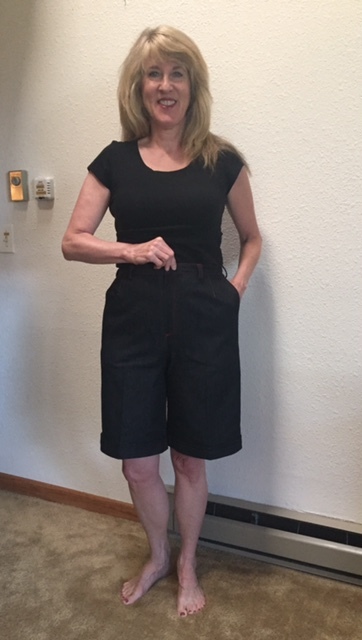 For my final pair, I made walking shorts. These were made from a denim with 3% lycra. I decided to have some fun with them and do lots of topstitching. 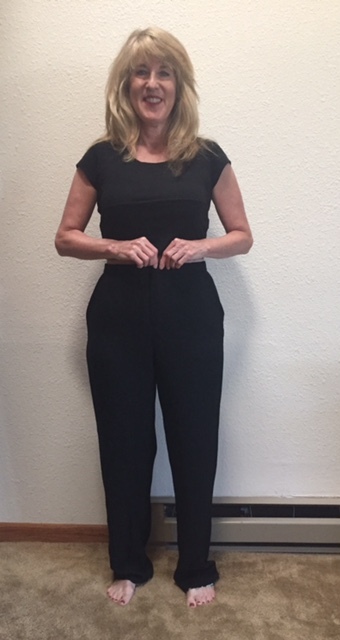 Due to the fact that the fabric has the added lycra, I had to take the side seams in a little more from my original alterations to the pattern. By doing this, it made the pocket opening just a little smaller. So I have made a note of this and if I make another pair with lycra, I will know to alter the side seam prior to adding the pockets. I even topstitched the darts. Since I wanted more of a walking short, I widened the leg a little on the outside and inside leg, and then added a cuff. The back. 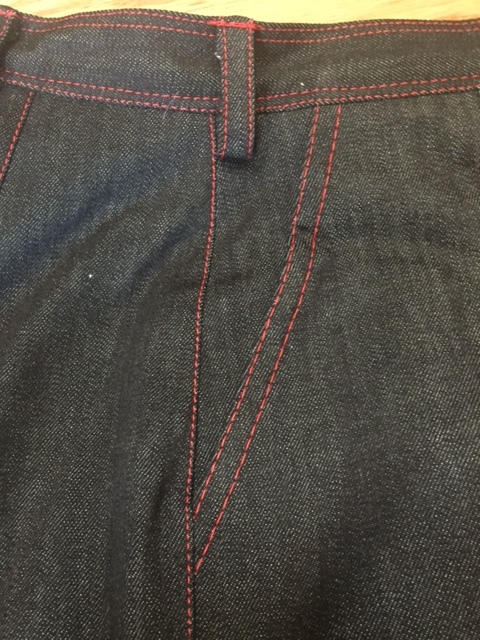 Although I sacrificed a little of the fit with the flat felled seams, I'm really happy with how they turned out. 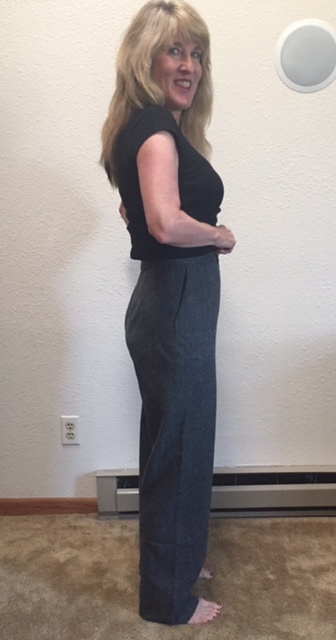 If you think that you might like to take a pant fitting class, Karen is thinking of doing another class either in September, or October. If you are interested, email her at karenssewunique@gmail.com. 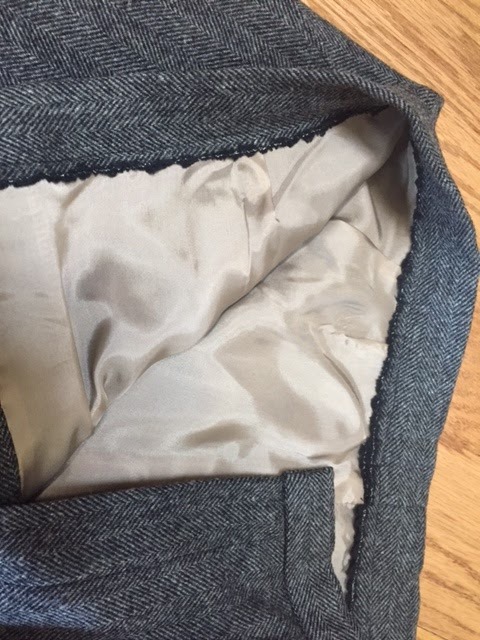 A little later today, I will be doing the second post on my pant experience. Here's a sneak peek. The pair below were the first pair I made and I made them out of a wool crepe. They are not hemmed. I'll have better pictures in my next post, along with the herringbone pants and the shorts. 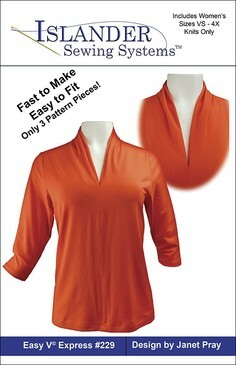 We will begin the sew along for the Islander Patterns Easy V Express Top tomorrow. If you would like to join in, there's still time to get your pattern with a 20% discount. Just remember to use the code RHONDA at check out. We'll also discuss lengthening the pattern to make a dress. 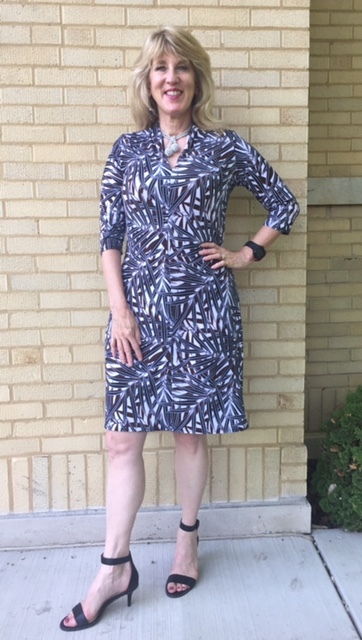 A dress out of this pattern is great as it's perfect for throwing on in the summer, and maybe even better with a shorter sleeve, or no sleeve. We'll also discuss deleting the sleeve, for a super cool version. With temperatures already hovering in the 90's. I'm looking for super cool! See you a little later! I haven't posted a recipe in quite a while, but this one, at least in my opinion :), is well worth the wait. I originally made the salad during the winter, but for lack of a better name, I'm calling it a Mediterranean Summer Salad. It's light, and yet hearty enough for a main entree when you would like a lighter meal. For those of you who are vegan, it's perfect as it's full of protein. 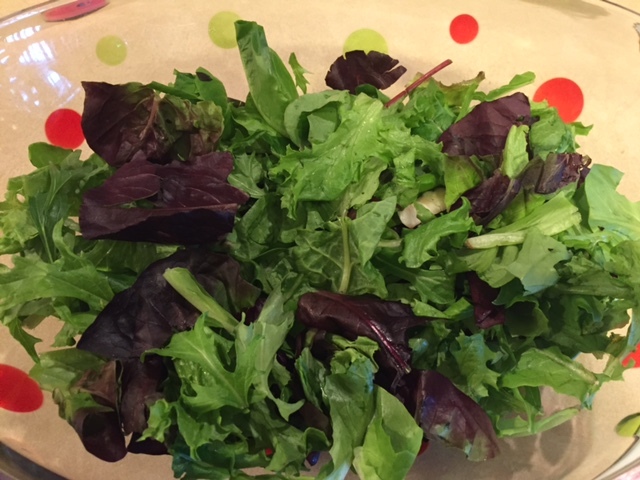 Easy, easy to put together, just begin with mixed greens, about 3 cups. I like to tear them up a bit before I add the rest of the ingredients. 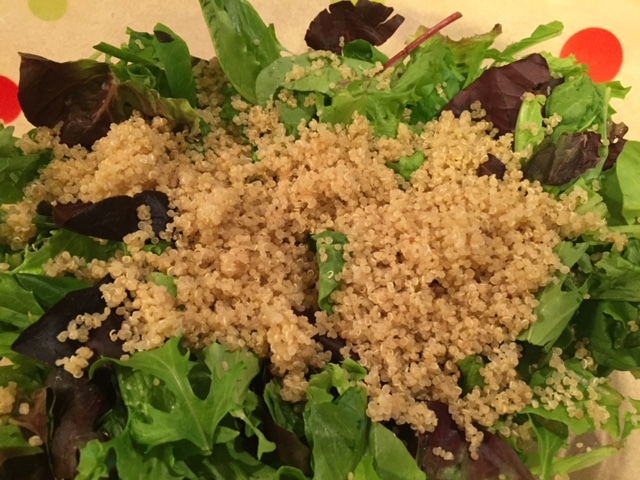 Top with 1/2 cup of cooked and cooled quinoa. 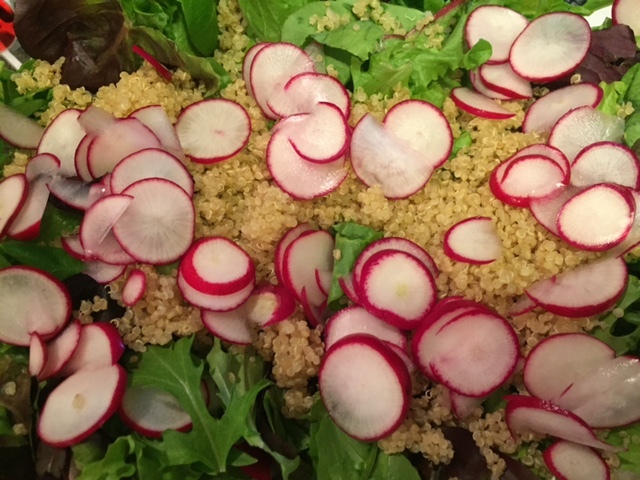 Next, 4 large, or 6 small radishes thinly sliced. Chop 1/2 of a fennel bulb. 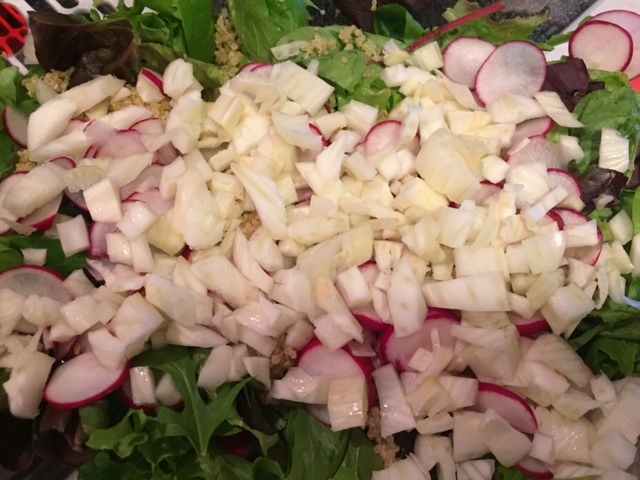 The spicy aspect of the radishes mixes perfectly with the slightly sweet taste of the fennel. Now add 1/4 cup of toasted and cooled chopped walnuts. 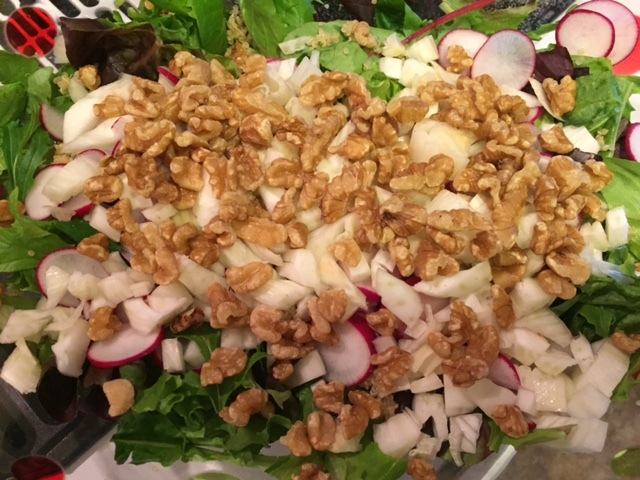 If you are in a hurry, delete the toasting, but if you have time, the toasting of the walnuts adds a nice flavor. Toss the salad and set aside. The dressing is so, so good. By all means, don't skip this step! 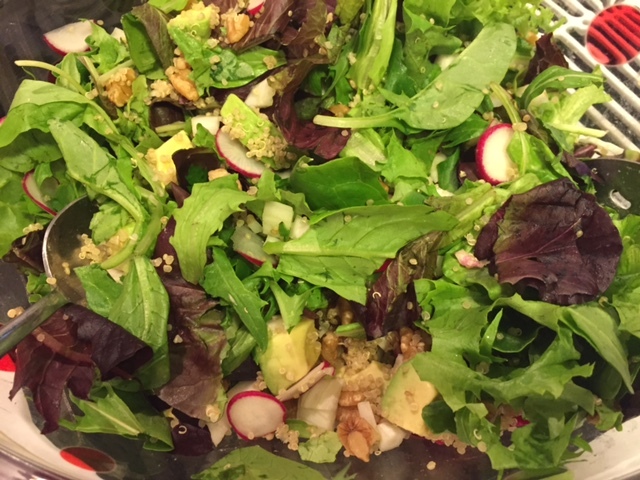 Dish up the salad, be sure to dig to the bottom as the good bits always fall to the bottom of the bowl. Drizzle the salad dressing over, dig in and enjoy! 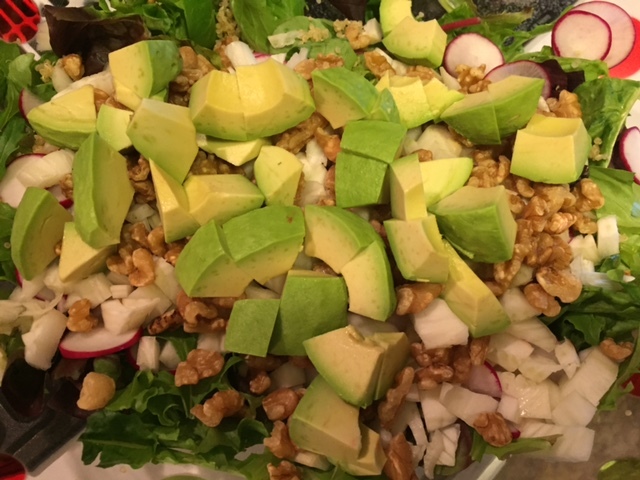 A warning, the dressing is so good that you'll want to eat it right out of the bowl!!! The salad will make 2 large entree servings, or 4 side servings. Just increase ingredients for a larger crowd. 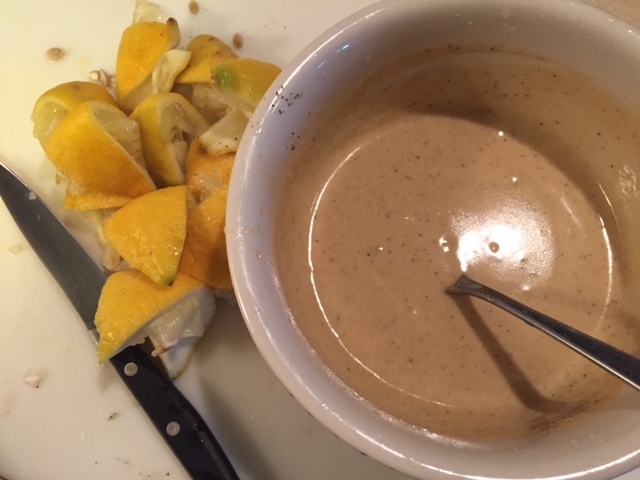 Stir to combine salad dressing ingredients. 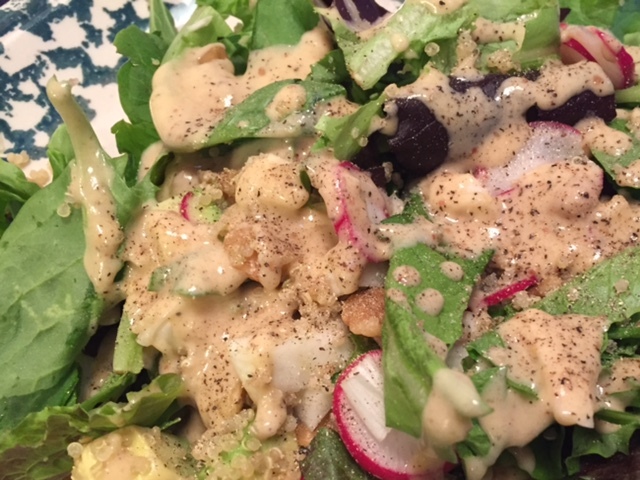 To serve, drizzle salad dressing over salad and enjoy! I'm A Discount Code At Islander Sewing Systems!! !